If you’re looking to create some ice cold and delicious blended smoothies, you’ll want a strong blender that’s capable of easily grinding down ice. 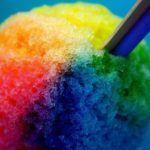 While most blenders can do this, only the more powerful versions are able to crush ice without wear and tear on the blending motor, or the blades. But don’t worry. We’ve done the research for you, and curated the best ice crushing blenders on the market down into this shortlist. Each of them is powerful enough to easily blend stunningly smooth iced drinks, as well as excel in a variety of other factors – like build quality and ease of use. Not sure which type of blender will be right for you? We can help. We’ve put together a short buyer’s guide after the reviews, which covers the most important aspects that most good blenders should have. By knowing which of these aspects are most important to you, it can be much easier to know which one of the recommendations will be best for you. Vitamix continue with their top of the line quality. Simplistic, robust, and efficient. The Vitamix brand for blenders have become what Apple is like for laptops. Known for outstanding quality without over-complicating their products – there’s no question that their blenders like this 7500 are the titans within their market. This model is a reflection of that quality. With outstanding material quality, simplistic but incredibly efficient controls, and a 7 year warranty that just exudes the deserved confidence that this product deserves. Plus, it’s made within the US. So while it does come with a price tag, it’s very well justified. You’re not just paying for a brand name, you’re paying for real quality. And for products like this, we think that kind of investment can be more than worth it. When it comes to crushing ice, the blades on this 7500 model are excellently designed for top performance. 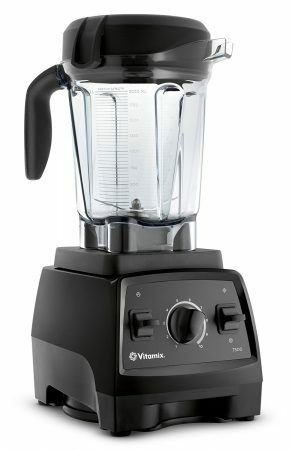 The blades are attached to a hugely powerful 1,440 watt motor – making this Vitamix’s most powerful blender motor to date. Perfect for crushing ice down to soft, smoothie-perfect flakes. Outstanding quality throughout - lives up to the brand name Expensive! 7 year warranty, which covers shipping costs You'll need to constantly deny family and friends wanting to 'borrow' it.. When we set out to find the best ice crushing blender, we had certain objectives we wanted met. High power, quality materials, easy to use, and reliable. Vitamix’s 7500 blender ticks all of those boxes. ‘Tick’ isn’t quite the right word.. more like blows them out of the water. It is expensive, true, but quality like this is worth paying for. Especially when you’ll be safe in the knowledge that for 7 years, Vitamix have your back with an excellent warranty, that’s known for reliability and great customer service. When it comes to a blender to make those perfect summer smoothies, you can’t get much better than this. 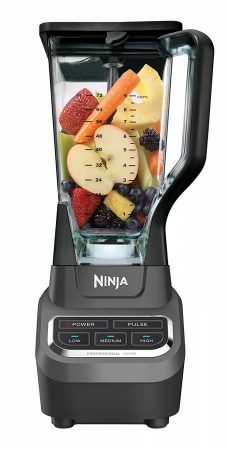 The Ninja Professional Blender is a quality model that can mostly match what it’s big brand cousins can do, at a fraction of the cost. The exterior is plastic, but extremely sturdy and secure. The motor isn’t jet-engine strong, but it’s still over 1,000 watts. The controls aren’t satisfying metal knobs, but they’re simplistic and very easy to use. All in all, Ninja have kept costs low by substituting in all the right places. At the end of the day, this is a great blender that is very well suited to crushing ice down to perfect smoothie thickness and texture. The main drawback, in comparison to the big brands, is in the warranty. At only one year vs. examples like Vitamix’s 7 year warranty, there isn’t quite the same after-purchase confidence. That’s not to say that the materials are bad quality, they’re more than adequate, but it’s the peace of mind that’s worth a lot more than just money. With that said, every other aspect of a good blender is covered. If you’re not a super-smoothie fanatic, and just looking for a great product that can make you great ice smoothies as well act as a great blender, this model is a solid purchase. In truth, we love products like this. It’s sort of like the subtly powerful, reliable, and safe family car versus a Ferrari or a Porsche. It’s name won’t ring out, and the quality won’t turn heads – but it does everything that you need it to do. Without leaving a hole in your wallet. The 1 year warranty is a bit of a shame, but considering you could buy multiple copies of this versus the big brand name models, it could be perfect if you’ll be a light-user who just loves a summer smoothie. A strong motor, robust quality, simple to use, and fantastic value. Fantastic build quality and precise pre-programmed buttons. When it comes to powerful blenders, BlendTec and Vitamix are a rivalry like Android and Apple are for phone systems. They’re the two top dogs, and if you’re wanting a top quality blender – you’ll likely be wanting to choose one out of the two. So what separates them? 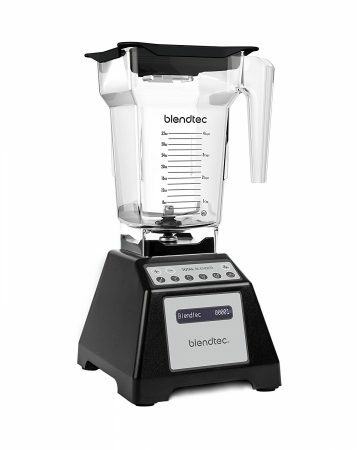 In this ‘Total Blender Classic’, BlendTec’s main advantage is the higher power. With over 1,500 watts of power, the motor in this blender is one of the most powerful we’ve seen. It’s more than capable of crushing down ice into meltingly soft pieces, perfect for smoothies. Combined with the high quality steel blades, and the ice crushing won’t cause anywhere near the wear and tear that it would on other models. BlendTec have also one-upped Vitamix on the warranty, too. Setting the bar at 8 years, a whole year more than Vitamix, there’s a real statement of confidence in the quality of this model. And it’s justified, too. The sturdy, impact resistance mixing container looks set to last a lifetime, with the easy pour spout making it perfect for soft smoothies. However, the real point to note isn’t in the quality comparisons with Vitamix. It’s in the main difference – the controls. While Vitamix have gone with just manual controls, this BlendTec model is focus on using pre-programmed modes to blend for a variety of purposes. This has the main advantage of providing a perfect blend sequence, varying the speeds to both provide you with perfect results and minimise any wear on the blades at the same time. However, it does limit the ease at which you can manually control the blending speeds to your taste. In this way, it’s a personal preference. While the BlendTec is simpler if you prefer to just toss in your ingredients and go, we do prefer having a bit more manual control over a product that we pay that much for! This is a quality product, which more than earns the high price tag which goes along with it. One of the best blenders you can ask for, it’s almost a future investment as much as it is a kitchen appliance. Don’t be surprised if it’s still being used within your family for decades to come. As well as the high powered motor built, the quality steel blades and impact resistant container make it perfect for crafting smoothies out of any ingredients – no matter how frozen. The 8 year warranty with a reputable company doesn’t hurt, either. For us, the choice comes down to the controls preference. Quality of this standard can also be found in Vitamix models – with the difference being that BlendTec focus on preprogrammed blending modes, versus Vitamix leaving the controls up to you. Whichever you prefer, both are fantastic options. 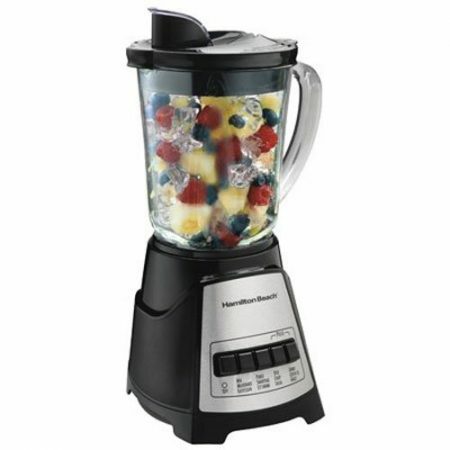 Note: Refurbished models of this blender are sometimes available, for a cheaper price and 3 year warranty. Check for availability here. Low price tag but still fully able to crush ice. A great entry level model. 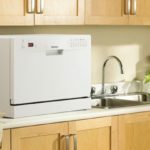 This Hamilton Beach model is a great solution if you’re looking to try out homemade smoothies, but not wanting to feel your wallet take a hit in the process. With a 700W motor, it’s a bunch our minimum recommendation for ice crushing (500W), but not by much. So while it’s fully capable of crafting you some deliciously smooth smoothies, the motor could suffer a bit of wear and tear which may come into effect further down the line. 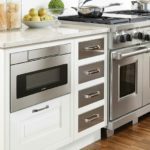 Hamilton Beach do cover the model with a 3 year warranty however, which is fantastic considering the low price tag. The cheap price doesn’t necessarily mean a lack of quality, either. The blender’s pitcher is fully glass, with the build quality in general being more than reasonable for a model like this. Our one issue is with the controls, which aren’t the most intuitive. However, this is balanced by the preprogrammed blending modes that the model come with – quite a high tech feature for what could be considered a basic model. This model is a great middle ground if you’re just looking for a blender to use occasionally, or to use while you wait until you’re ready to get a top tier Vitamix or BlendTec model. It’s fully capable of making smoothies amongst any other blending needs, and both looks and feels the part, too. With cheaper models like this, a short warranty is usually a big turn off. However, the 3-year backing from Hamilton Beach makes gives this model incredible value. If you’re not sure which of the above blenders would be right for you, it’s helpful to break them down into what they specialise in. 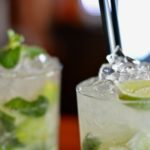 Below we’ve outlined each of the main aspects that you should look for in a good ice crushing blender. By knowing which of these are most important to you, it might make it easier to know what model will best suit your personal tastes. 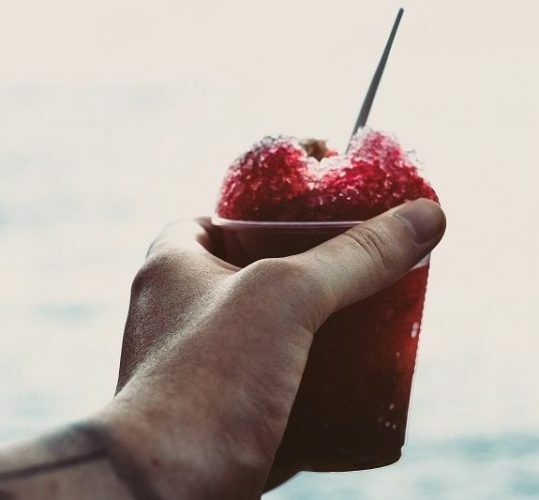 Blending Power – The most important aspect for ice crushing. Making sure that the blender has enough power to actually crush ice (we recommend a minimum of 500W), but also enough that it won’t cause wear and tear to the motor in doing so (typically around 1000W power). Durable Container – Working with thick, impact resistant plastic or glass is vital if you want the blender to last a good amount of time. 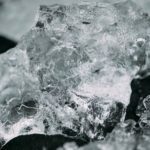 With miniature ice chips flying around at high speeds, the container needs to be robust enough to handle that kind of impact. Durable Blades – The blending blades are a vital component of any blender. Look for high quality steel, especially those types that have been made from one piece of steel only, not joined together which can form a weakness. Blunted blades are best for crushing ice – sharp blades risk small bits of the blade getting torn off! Good Controls – Generally, there’s two ways blenders work. Either through your own manual input, or through pre-programmed modes. There isn’t a particularly better option. Pre-programmed is simpler and easier, but you lose the ability to control what’s going on – making it harder to experiment with different techniques. Ease of Use – Similar to controls, a good blender will be both easy to use and maintain. Look for containers with clearly marked measurements, pouring spouts, well-sealed lids, and detachable blades for easy cleaning. Well, that about wraps things up! 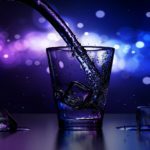 We think that while each of the above blenders are a great choice for crushing ice, that there’s a good variety between them – ranging from great value multi-purpose blenders to top quality ice-crushing powerhouses. If none of these blenders have caught your eye, fear not. There’s plenty more on Amazon – check out their bestseller list here. Though we can’t guarantee that they’ll be as good as our researched recommendations!